In 'The Artist,' A Silent Look At Old Hollywood In the new film The Artist, the era of silent film giving way to sound is depicted with an unusual return to silence. That meant different challenges for the actors — even those who walk on four legs. 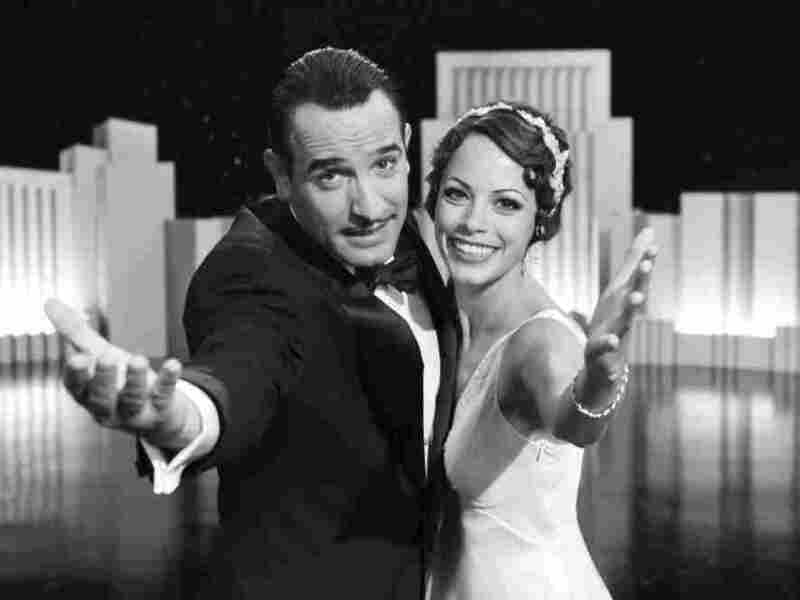 Silent Screen idol George Valentin (Jean Dujardin) and Peppy Miller (Berenice Bejo), a young and upcoming dancer, share a vivacious moment on stage in Michel Hazanavicius's film The Artist. Director Michel Hazanavicius met me at the Bradbury building in downtown L.A. It's the location of a key scene in his audacious new movie The Artist, which takes place just at the moment when talking pictures supersede silent films. "It's mythic," said Hazanavicius of the era during which Charlie Chaplin, Douglas Fairbanks and Mary Pickford were stars. In the scene shot here, a dashing film star reminiscent of Fairbanks bumps into his lovely young protégé on the building's remarkable staircase. He's on his way down; she's on her way up. On the way down is precisely where George Valentin, played by French heartthrob Jean Dujardin, finds himself. He's unable to adapt to the newfangled talkies and his career is about to be ruined. Like so much else in The Artist, the location at this moment is a loving reference to cinema — the Bradbury has appeared in dozens of movies, most famously Blade Runner. The Artist is itself a silent film, and black and white. But in spite of what might seem to be two formidable barriers to mainstream popularity, it's generating some of the strongest Oscar buzz of the year. Hazanavicius convinced producers to invest in The Artist based on the strength of two domestically successful comedies he directed about a 1950s French secret agent. "That's one of the most difficult parts of the entire process," he sighed. "So they said yes, but it was a very shy yes." The Artist was shot on classic old Hollywood back lots, as well as historic locations, including the Orpheum Theater. And the cast includes some great American faces, including John Goodman and James Cromwell, who you might remember from Six Feet Under and Babe. "My goal was not to be in a silent picture," Cromwell confessed to NPR. Contemporary screen actors like to use their voices, he said, and use tricks incommensurate with silent film. For example, "You keep your eyes wide open, always, because you don't want to blink. Because when you blink, the director's going to cut away from you. So you betray as little of your inner life through your face as possible, and everything is done by the dialogue." Acting in a silent movie, for Cromwell, was liberating. "It's all on your sleeve," he said. Making this film turned out to be liberating for another of the film's stars-- a scruffy little dog named Uggie. Because The Artist is silent, Uggie's trainer could bark commands, so to speak, whenever necessary while the cameras rolled. "Usually he has to wait for the actors to stop talking," Hazanavicius grinned. "Maybe that's why the dog is so good in the movie." In fact, Uggie won this year's "Palm Dog" for canine acting. It's just one of a heap of awards The Artist has accumulated, including the prize for best (human) acting at the Cannes film festival. The Weinstein Company, which won a bidding war to release the film in the United States, is banking on The Artist carrying off even more prizes, of the golden Oscar-shaped variety, at the Kodak theater come February.